Vancouver has an ideal climate for Moths to thrive in. Moth & carpet beetle infestation is a common cause of rug & carpet damage and can be prevented in most cases, it usually appears when rugs & carpets are improperly stored or neglected, on a few occasions the infestation appears when the rug or carpet is in use. It’s important to vacuum your carpets and rugs weekly this will go a long way in keeping these pest at bay and removes any eggs and larvae before they hatch. You should also inspect your rugs and carpets on a regular basis and have them professionally cleaned at least once a year to prevent the damage and costs of repairing. 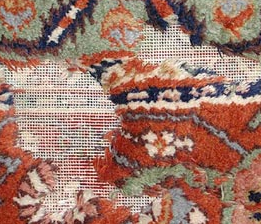 When storing your rugs and carpets remember that Moths and beetles can get through extremely tight spaces. Plastic bags & containers are the best way to protect your rugs and carpets, to protect from condensation wrap them in a length of cotton fabric. Some plastics do degrade over time so if you are planning on storing valuable rugs and carpets for years rather than months you should contact a professional conservator for their recommendation.